The Kissing Hand by Audrey Penn is a perfect back to school book for Kindergarten and First Grade. It’s a (affiliate) story about a raccoon named Chester who is worried about starting school. The Kissing Hand Craft we are sharing today is a great book extension activity to make after reading the book and discussing how the children relate to Chester. 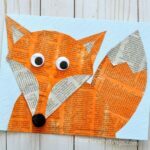 We made ours with newspaper because we love creating with newspaper but you could easily make it with gray cardstock as well. 1. 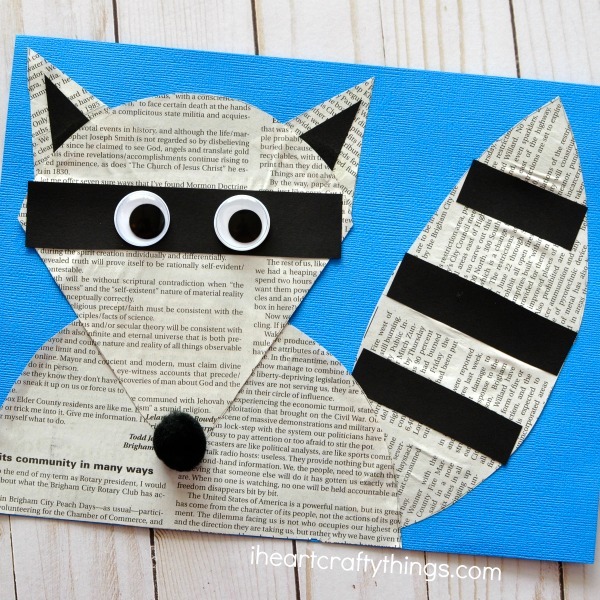 Begin by cutting your raccoon pieces out of your newspaper. 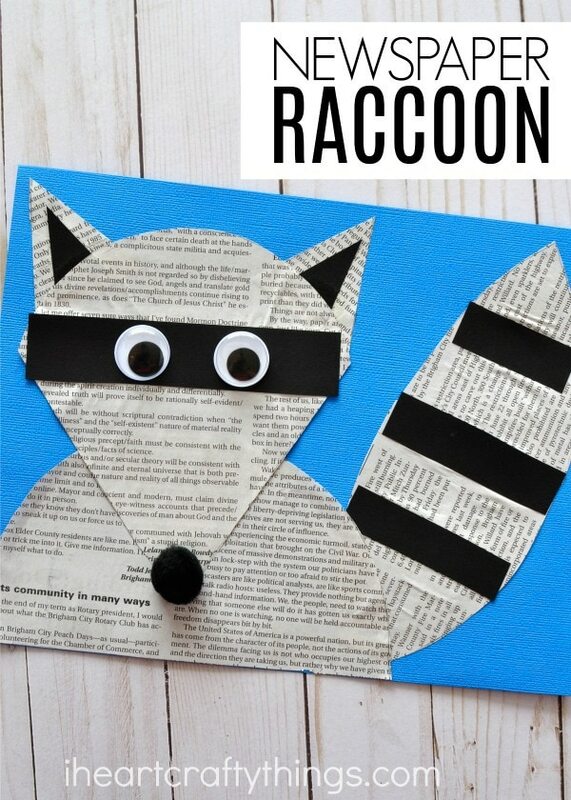 You’ll need a triangular raccoon face, a half circle body shape, a tail and two triangle ears. 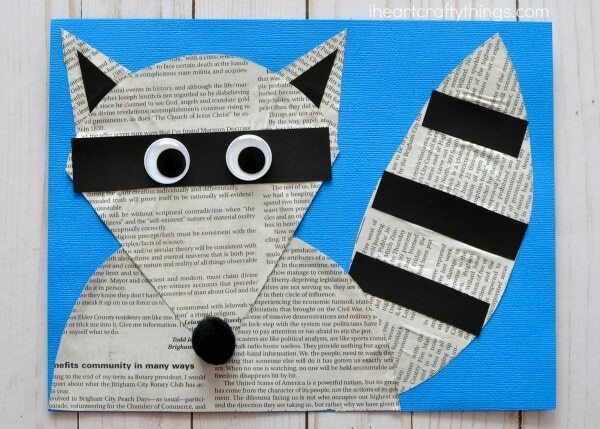 You can also purchase the raccoon pattern at my Teachers Pay Teachers. 2. From your black cardstock cut out a strip for an eye patch, two small triangles for the inside of the ears and three tail stripes. 3. 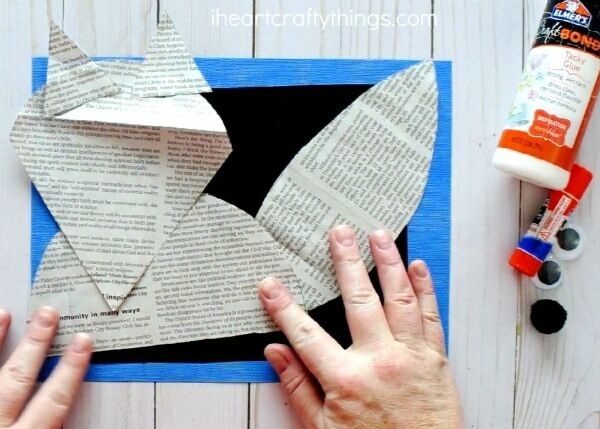 Glue your black pieces onto the coordinating newspaper pieces. 4. 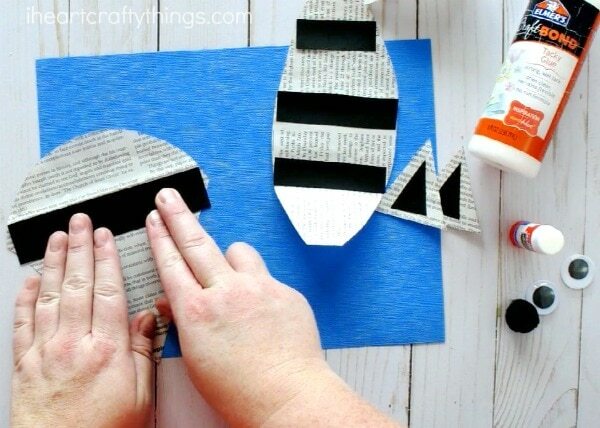 Lay your blue cardstock out horizontal and glue your tail onto the right side of your paper. Glue the raccoon body overlapping the tail a bit and ending at the left side of your paper. 5. Glue the triangle ears on the back of the racoon face and then glue the face in the middle of the raccoon body. 6. Finish your The Kissing Hand Craft by gluing on your googly eyes and black pom. Looking for more fun back to school activities? 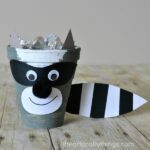 Here is another fun raccoon craft that includes lots of kisses you’ll love! 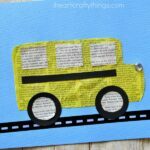 Kids might also enjoy creating a school bus out of newspaper.